Here is the mystery plant. 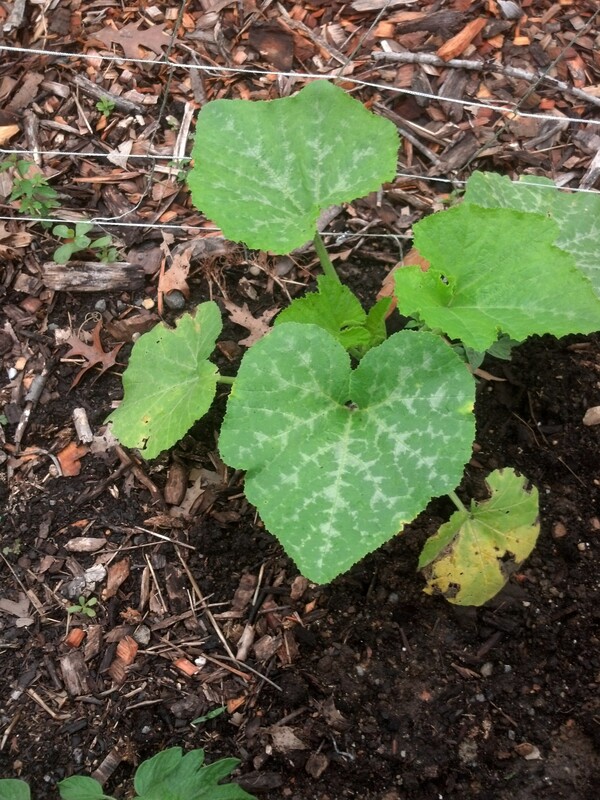 If you can guess what it is, we’ll share whatever…”it”…produces this summer! I hadn’t visited the garden in about 10 days. CRR was there every day, so it seemed redundant to make a site visit when he gave me a 5-minute report each evening –along with a nice salad as evidence. Ten days turned out to be an eternity in vegetable years. Apparently, 90-degree heat and abundant rain was all our little vegetables needed to muscle their way toward puberty. Two tomato plants – Indigo Rose and Brandywine – sport little fruits about the size of a small egg. One pepper plant brandishes a 2-inch-long jalapeno. We’ll be eating the first beets this week – some of the red ones are already 2-3 inches across. Our only cherry tomato seems to be in need of some TLC but with we are left scratching our heads because rain and sun have both been plentiful. The peas have pooped out, victim to some rust or blight that afflicts us every year. The lettuce and spinach seem to be surviving on the rain, heat be damned. And we have two “mystery” guests – volunteers that every year we swear we will eradicate upon sight. But CRR, of the tender heart, is nursing these two lucky orphans along. In our haste to get to the baseball game today (Go Nats! ), we neglected to take a photo. I’ll post one soon so you can play the guessing game with us.